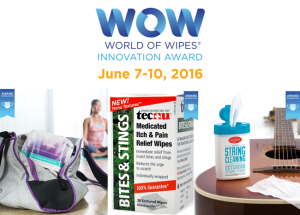 Cary, NC, April 26, 2016 – Wipes for unique applications from cleaning string musical instruments to providing pain relief from insect bites and removing makeup are in the running for this year’s World of Wipes Innovation Award®. The three finalists will present their products at the World of Wipes® International Conference June 7-10 at the Sheraton Grand in Chicago. The award winners will be selected by attendees and announced during the conference. WOW 2015 drew more than 500 attendees from every area of the wipes sector and this year promises to do the same in its 10th edition. The annual World of Wipes Innovation Award® recognizes the product that both expands the use of nonwovens and demonstrates creativity, novelty, uniqueness, and technical sophistication. Nominated products come from within the entire nonwoven wipes value chain. These wipes solve a common problem women have with existing make-up remover wipes that do not leaving the face feeling as clean as liquid cleanser and water. Kleenex Facial Cleansing Wipes solve this problem by using Kimberly-Clark’s patented co-form with micro-fine fibers to lift and trap dirt, oil and make-up. Co-form fibers can be up to five times smaller than those of Spunlace. The pre-moistened wipe contains a water-based cleanser that makes the skin feel freshly-washed-clean in just one step. clean for fresh and high quality sound; Polish Wipes for cleaning oil and grime on wood; and Lem-Oil Wipes for cleaning and conditioning fretboards. These medicated itch and pain relief wipes provide immediate relief from insect bites and stings, reduce the urge to scratch, and are individually wrapped to easily take on outdoor adventures. The patented homeopathic wipe features Tecnu Textures™ technology. The textured side of the wipe is used to provide immediate relief from insect bites without breaking the skin while the smooth side is a softer application for tender bee stings. For more information on WOW 2016 or to register, visit: http://www.inda.org/events/wow16. Follow us on Twitter #Wipes16.